I do a fair bit of drawing and reading, two activities that generally require good lighting. Thus, you’ll find more than a few extra lamps in the various rooms of my house. This is because standard overhead lights either don’t cut it, or provide more light than I need, depending on the situation. My favorite kind of lamp is one attached to an adjustable arm. This is because I can quickly and easily reposition it without much effort. Wouldn’t it be great if larger lamps were this easy to adjust? Well now you can buy one that is. 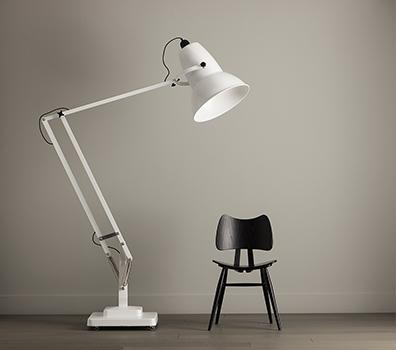 The Anglepoise Giant1227 Classic Range may look like your average desk lamp, however, it is anything but. In fact, it can’t actually sit on your desk at all(unless you have the desk of a giant, that is). Instead, its shape mimics one that you might see sitting in an office. It uses a set of aluminum bars and springs to keep the beam of light just where you need it. So how large is this lamp? It is roughly three times the size of its smaller brother. It stands a little over 6.5” tall, and even the lamp shade is about a foot and a half across. For lighting, it comes equipped with a 100 watt halogen reflector bulb, though it can be replaced with any standard bulb. Unlike most similar desk lamps, you’ll find a dimmer, so you can get the lighting just the way you want it. Now I bet you’re wondering just how much this interesting lamp will set you back. Unfortunately it is priced like an art piece, rather than a simple piece of home décor. You’ll be looking at around $3,500 to get one for yourself. If you do feel like picking one up, you’ll be able to choose from white, black, grey, or red.